The Weber Genesis 7553 Grill Cover is the premium cover for the Genesis Gas grill “E” and “S” 300 series models. We have taken an in depth look at the most current version of the cover (the older version was not a fan favorite!) to examine whether the cover is capable of doing what is supposed to do!! We also provide some links at the bottom of this page so you can compare retailers prices to find the best on sale prices for the Weber 7553 Genesis 300 Series Grill Cover. 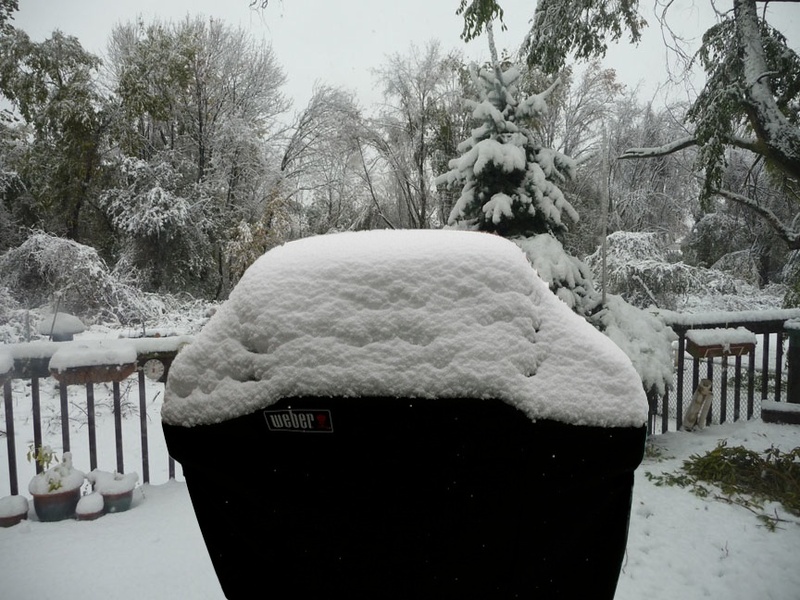 Protect your grill from whatever the weather throws at it! So, you’ve just invested a considerable amount of money on a grill from the highly acclaimed Weber Genesis 300 series. You’re going to need to get used to your friends and neighbors being seriously jealous when they see this little beauty of a BBQ grill sitting in your back yard!! However, outdoor grills, no matter the cost, can soon look dirty if they don’t get the occasional cleaning and attention they need. The smartest thing grill owners can do to protect their beautiful grill from the elements such as the sun, wind, rain, hail, snow and dust, is to invest in a grill cover. The Weber 7553 Grill Cover is purposely made to fit like a glove and protect your Genesis grill from the elements. Make sure you get the new version of the 7553 Grill Cover! Now, just in case you’ve read a couple of reviews that say the Weber 7553 Grill cover isn’t very good we’d ask you to check again to see how long ago the article was written. If the review is more than a year or so old then it more than likely refers to the old Genesis cover. You see, there’s no secret that the old version of the Genesis cover was, to be honest, pretty useless and prompted much criticism from buyers. Most complaints mentioned that the air vents on the sides of this cover easily let rain and dust get inside, making the whole point of a cover practically moot. However, Weber listened to its customers and quickly responded by developing and launching a new cover model without the vents, and the 7553 Grill Cover went from panned to praised by the vast majority who tried it on their Genesis grill. Velcrow straps are in a convenient position to keep the cover in place. We agree that getting rid of the side vents was a major step forward for this product. But we also found a lot more to like. For starters, the new version comes with adjustable Velcro straps that can be tightened to provide extra protection against high winds, and also keep the cover from blowing off. Owners of the covers have experienced strong storms with very high wind speeds and have been happy to report that the next day the cover was in tact, and the grill inside was dry. It’s like the storm never happened! The Velcro straps themselves are also well made and securely attached. In addition to the Velcro side straps, another Velcro strap beneath the shelf enables an even more secure fit. Easy on the eye, easy on the grill! Speaking of cosmetics, or perhaps we should say aesthetics, this grill cover is sleek and pleasing to look at. When you have something of this size sitting out on your deck or patio, well, you want it to look good, maybe even classy. This cover doesn’t look like some cheap plastic ill-fitting tarp you dragged out of your garage. Rather, it fits the image of a high-quality, gleaming, high-end grill. It’s rich slate-black color is a nice touch. Some owners have even likened the Weber logo in the upper left corner of the cover to an emblem on a fine sports jacket – although others have suggested they would have preferred a less conspicuous logo. It’s a matter of taste and preference we guess. It is possible that the fabric will fade more readily under strong sunshine, although that’s purely a cosmetic issue and will not affect the primary function of your grill, which is of course to cook great tasting food. The Weber 7553 grill cover comes in one attractive color option – black! However, if you decide the black look of the Weber cover is not for your back yard, then you may wish to consider a popular alternative to the Weber 7553 cover – check out the different color of the Classic Accessories Terrazzo Cart BBQ Cover Medium 53912 . How about ease of use? Again, the 7553 Grill Cover scores high marks here. Fitting the cover over the top of the grill can be like slipping on a glove. The approximate dimensions of the cover are 30-inches by 60-inches by 50-inches and it fits like it was tailor made for the Weber Genesis “E” and “S” 300 series grills, which it clearly is! 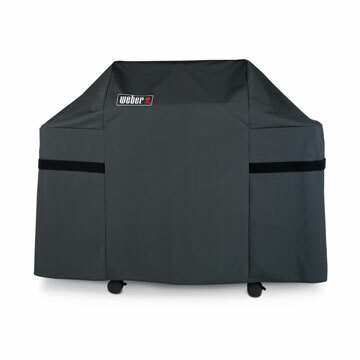 The Weber 7553 Grill Cover weighs approx 3.6 pounds (ship weight approx 5 pounds). The covering procedure can be handled by a single person, meaning that pulling, tugging and adjusting is minimal. This newer version of the Weber 7553 Grill Cover is also constructed of a more supple material than its predecessor, giving it remarkable pliability, ease of use, yet retains its strength and durability. The Weber designers found a way to make a fabric that is both supple but rugged at the same time. Some owners of the earlier version (with the vents) have reported that it lasted for many years, and this version should mirror that durability, while also providing far enhanced protection for the grill. Overall, it’s difficult to find fault with the current version of the Weber 7553 Genesis Grill cover . Your Genesis grill itself reflects a significant investment on your part, and we are sure you’ll agree that investing a little cash in this remarkably well-designed cover to protect it makes a lot of sense. With regular use, a well fitting and durable cover can extend the life of a grill considerably – and the 7553 Grill cover should do so while looking great on your deck or patio. It’s top marks all round and a high recommendation for this 7553 Grill Cover by Weber. 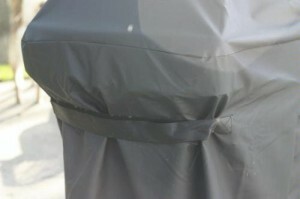 Did our review help you decide that a grill cover is going to extend the life of your grill? If it did, it would help us out if you could click the Facebook Like or G+ button below. Thanks!